When I think about a Labor Day weekend menu, I think about fun foods that you can eat with your hands. I also think about that last, fleeting opportunity to celebrate all of the best of summer deliciousness. So I thought this Country-Style Oven”Fried” Chicken Sandwich was perfect for this time of the year. 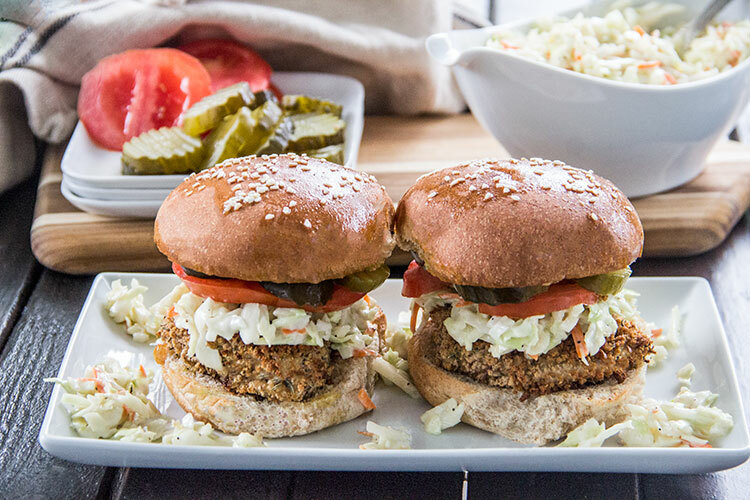 With creamy coleslaw, fresh juicy tomato, and sweet-yet-tart pickles, it’s a comforting, picnic-like chicken dinner between two burger buns. …until Chris described a “picnic burger” with those ingredients that he tried in a restaurant. That was the inspiration for this recipe and, wow, the combination really, really works. It creates a chicken sandwich that is flavorful and savory and rich and fresh and crisp all in one. 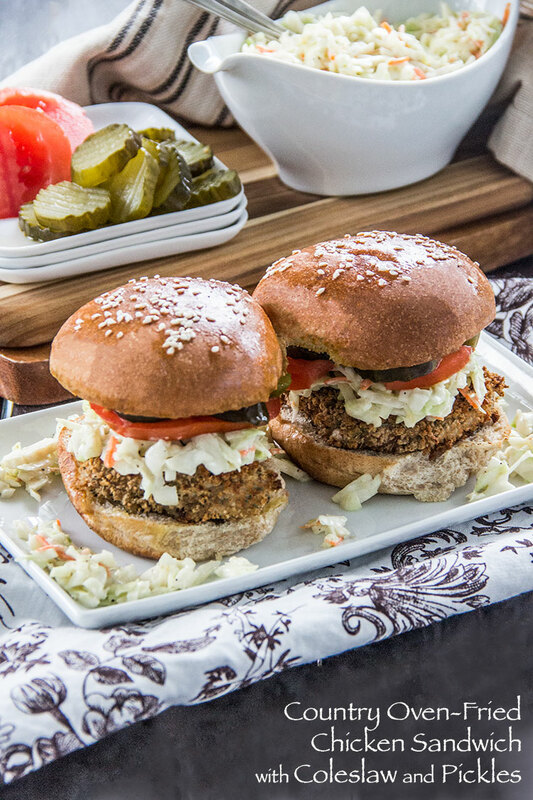 And, with fresh veggies and flavorful, crispy chicken that’s baked in the oven instead of fried, it’s an indulgent-tasting chicken burger with a healthier preparation too! Add the panko breadcrumbs, 1 teaspoon onion powder, 1 teaspoon garlic powder and the thyme to a large plate or platter. Season well with salt and pepper. Stir until well combined. Brush a thin layer of Dijon all over each side of each chicken breast (about 2 teaspoons Dijon in total). Place each chicken breast half in the breadcrumb mixture and flip, continuing until all sides are well coated with breadcrumbs. Arrange chicken breast halves on a parchment-lined baking sheet. Measure about 2 teaspoons olive oil and drizzle oil all over the tops of each chicken breast half. Cook for about 17-19 minutes, or until breadcrumbs are crisp and golden and chicken is cooked to the center. Meanwhile, to a mixing bowl, add the shredded cabbage, mayonnaise, and 1 tablespoon Dijon. Season well with salt and pepper, and stir until well combined. Slice each burger bun in half and arrange on a parchment-lined baking sheet so that no two are overlapping. Measure about 2 teaspoons of olive oil and, using a basting brush, brush oil over each bun top. Sprinkle garlic powder (about 1/2 teaspoon in total) and sesame seeds (about 1/2 teaspoon in total) all over each bun top. Place the baking sheet under the broiler and toast until burger buns are golden, about 2-3 minutes. Arrange each sandwich by placing one chicken breast half on each bottom bun. Add first heaping spoonfuls of coleslaw, and then tomato and pickle slices. Top each with a bun top, and serve immediately. You had me at coleslaw and pickles! Yum.